Indian Coast Guard Navik Result 02/2018 Merit List Expected Cut Off Marks Navik GD Result 2018 Publishing Date www.joinindiancoastguard.com: The result of the recruitment examination conducted by the Indian Coast Guard (Ministry of Defence) for the post of Navik (General Duty) in the Indian Coast Guard, an Armed Force of the Union will be published after the commencement of the written test in the month of February- March 2018. The tentative month for the publication of the result a declared by the recruitment authority is July 2018. If any announcement is made on behalf of ICG regarding the exact date of the written examination and the publication of the result then we will notify the candidates immediately about it and therefore the candidates ought to check our website www.jobsandhan.com at regular interval to stay updated. Latest Update: The department is going to publish results of the Indian Coast Guard Navik Result in August. Preparation of the Merit list of Indian Coast Guard (Ministry of Defence) for the recruitment of Navik (General Duty) 2017-18: The recruitment authority of Indian Coast Guard under the Ministry of Defence will prepare the Merit list for the selection of Navik (General Duty) in the Indian Coast Guard, an Armed Force of the Union based on the score of the written test as well as successfully qualifying in the Physical Fitness Test (PFT) and Medical Examination. The result will get published in the month of July 2018 and the students will be able to check their result from the website www.joinindiancoastguard.gov.in by putting their registration number / roll number there. The written test will be Objective type and it will comprise questions from Mathematics, Physics, Chemistry, General English upto 12th standard, General Knowledge, Current Affairs, Quantitative Aptitude and Reasoning. The candidates scoring high in the written test will be called for the Physical Fitness Test (PFT). Those who will successfully go through this sieving process must undergo Medical Examination. Getting clean chit in these two stages will be required along with the good score in the written test to get a position in the final Merit list of ICG Navik (General Duty). 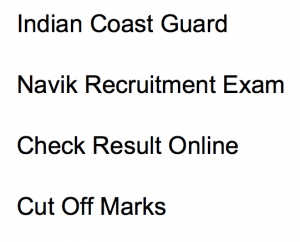 Cut off Marks of Indian Coast Guard (Ministry of Defence) Navik (General Duty) 2017-18: The cut off marks for the post of Navik (General Duty) in the Indian Coast Guard under the Ministry of Defence has not been announced but it can be concluded by saying that the selection of the candidates will be done on the basis of the Merit list. General / OC / UR / SC / ST / OBC cut off marks for the post of Indian Coast Guard Navik Recruitment Written Test 02/2018 will be different for each category. Sir when u will announce coast guard gd merit list sir….. Please infrom me sir…..
what is expected cut off of coastguard navik gd?